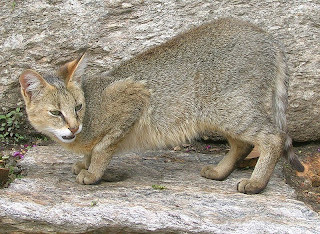 The jungle cat (Felis chaus), also called the swamp lynx (although not closely related to the lynxes), is a medium-small cat, but is now considered the largest remaining species of the wild cat genus Felis। It averages 70 cm (28 in), plus a relatively short 20 cm (8 in) tail, and stands about 36 cm (14 in) tall. Weight varies across the range from 4 to 16 kg (8.8 to 35 lbs), though exceptionally heavy specimens have also been reported. Dependent on the subspecies the colour of the fur is yellowish-grey to reddish-brown. While vertical bars are visible on the fur of kittens, these bars disappear in adult cats. 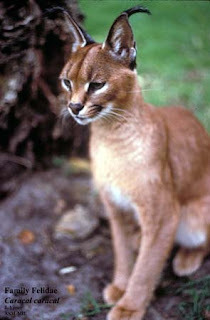 Due to the pointed ears and the long legs this cat resembles a small lynx (hence the name "swamp lynx"). This cat is distributed over Egypt, West and Central Asia, South Asia, Sri Lanka and Southest Asia. It inhabits various habitats, for instance savannas, tropical forests the reedbeds rivers and lakes, but it is not found in rainforests. 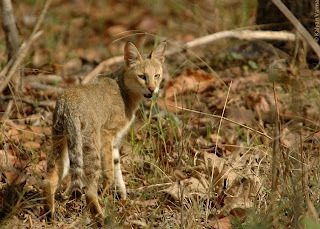 In some areas the jungle cat comes close to villages and may even live in deserted houses. 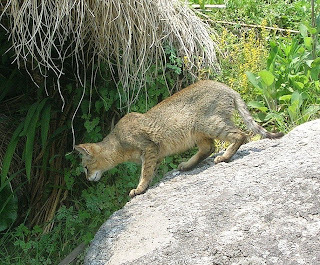 The jungle cat lives in heights up to 2500 m, but is more common in the lowlands. 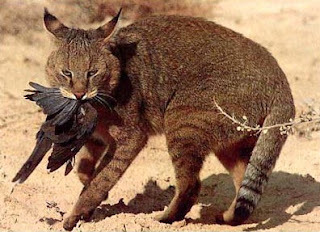 Jungle cats hunt in the daytime for rodents, frogs and birds. Those cats living close to bodies of water are able to swim and dive in order to catch fish. 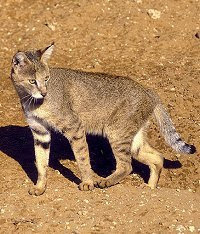 This species has been hybridized with the domestic cat producing the "chausie" breed. During mating season, the male "barks", sounding like a large dog. 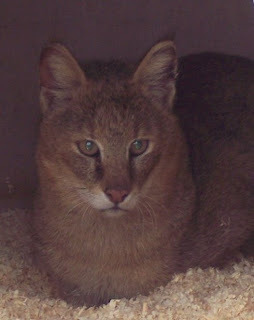 In captivity, males have been observed to be very protective of their offspring, more than the females of their own species, or males of other cat species.